I was given this mill vice with the second hand mill/drill I bought a couple years ago. 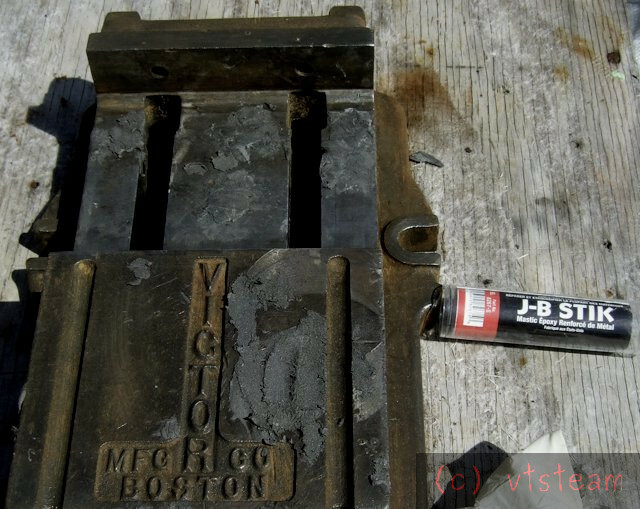 Scraped some of the crud off and read "Victor Boston" There was no handle, and no jaws. 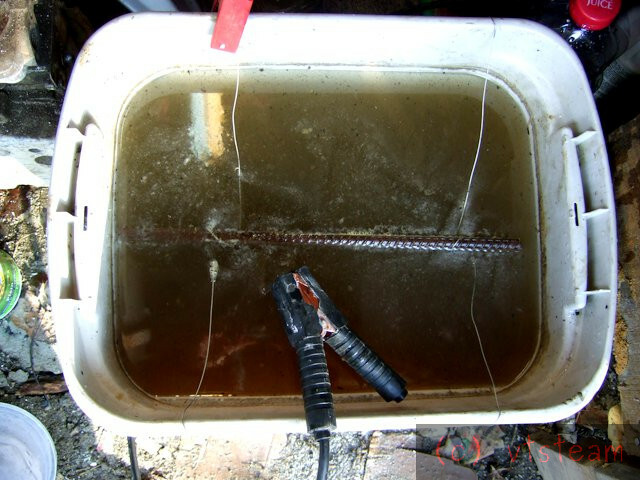 I read Darren's thread about electrolytic rust removal, so I figured I'd give it a shot. Bought some Arm and Hammer washing soda (sodium carbonate) and put a half cup of it in some water. Used a piece of 1/2" rebar as a positive electrode, and wrapped a piece of steel wire around the vice to attach to the negative electrode. Connected my auto battery charger and watched the bubbles start to form. Best position for the positive electrode seemed to be parallel with the vice and directly over it. The action does seem to be somewhat directional. I checked back in a couple of hours. I couldn't see anything in the brown water, so I just pulled it out and hosed it off. That came out nicely, looking forward to see the final outcome. Nothing is impossible, it just take more time to figure out. Wow, that's quite the difference! I need to try that some time. That's an easy way to clean up an item, much better than a wire brush, and no dust! Leaving in citric acid solution overnight will give the same result without all the wires. 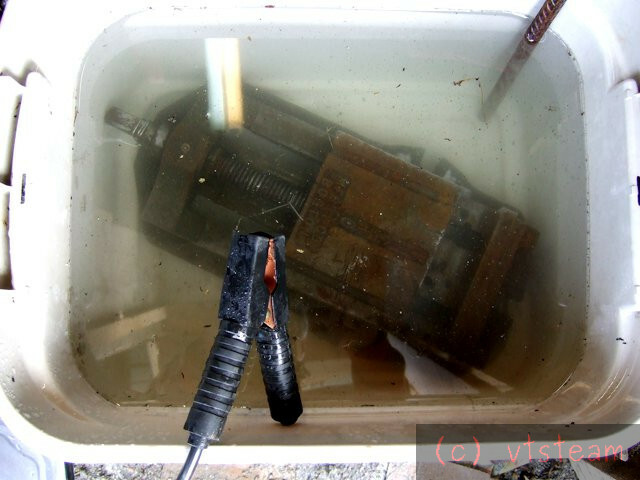 I used to use the electrolytic method which works very well but is dangerous indoors as it liberates hydrogen and oxygen in an exactly explosive ratio. Since I discovered the effectiveness of citric acid I've gone over to using that. Good luck with the rest of the fix! In what form do you find the citric acid, and form where? I buy it by the 5kg bag of powder on eBay - not expensive and it goes a long way. Dilution not critical - say about 100 grammes in a 2 gallon bucket. Better slightly warm but it just speeds things up rather than being essential. Lots of ways to skin a cat -- I like the washing soda electrolytic method having just tried it. I've also seen sodium bicarbonate (baking soda) used, though it's more expensive, it's even more widely available and still cheap enough. What I used, was sodium carbonate -- available everywhere at supermarkets --used for clothes washing, and the cost was 15 cents for this tub full of solution -- which can be re-used. In fact I have a big old dividing head that needs to be restored, and that will be next in the tub, plus a bunch of other rusted odds and ends. But chemical methods like citric acid seem good, too, if you have it. Whatever works! re. explosive gasses and safety -- Charging an auto battery (with the same charger) also liberates oxygen and hydrogen, and in this case I was drawing less than an amp, so the gas evolution (charge) rate was low compared to an open lead acid cell. I kept the shed door open, and the tub in the open doorway itself, so essentially it was outdoors. (the shed used is unfortunately "ventilated" in the extreme, even when closed!) I also didn't leave it unattended or over night. I checked it periodically, had it on a 2 hour timer on the charger, and that's how long it took to clean up. I always turn off a charger before removing battery clamps from a battery -- learned that one when I was 19 the hard way -- and I did the same for this. Just including the above in case someone else decides to try it as well. btw. I remember there used to be an old rumor that Coca Cola would clean the rust off of tools. Never tried it. But I wonder now if it was the citric acid in the soft drink that was the "active" ingredient! Hope it's the right stuff! No - Coke has phosphoric acid in it that also acts as a rust converter rather than remover - The iron phosphate formed is attached to the base metal. Battery charging : I once lost a pair of spectacles and got a face full of sulphuric acid when I took a battery off charge, and the spark ignited the H & O2 in one cell, blowing the top clean off all over my face. Not pleasant so I'm a bit sensitive about explosive gas mixtures !!!!!! Same thing happened to my step-brother. he removed the charger clips without turning off the charger and the top blew off the battery. "learned that one when I was 19 the hard way" <---- ahem, same here -- luckily I was near a sink in the garage I was working in. It was on the other side of a jeep, which I apparently leaped over entirely to get to water, according to spectators. That was a commercial charger running at 40 amps. Important to turn a charger off before removing battery clamps. A wait doesn't hurt either. Even outdoors. I decided to fill the divots with metal filled epoxy putty -- JB Stick. I've had good luck with it on cast iron in the past. It cures very fast -- about 2 minutes working time after kneading it together. I use rubber gloves and it's important to wet them with water, or this stuff will pull them off. Also you can't easily putty knife it. Best bet is just press it in place. After it had cured for a half hour, I filed the epoxy down with a coarse file. Then I hit the ways with some petroleum jelly, and a few other areas I wanted to mask as well. The drill divots on the ways looked pretty good after filling with epoxy and oiling. 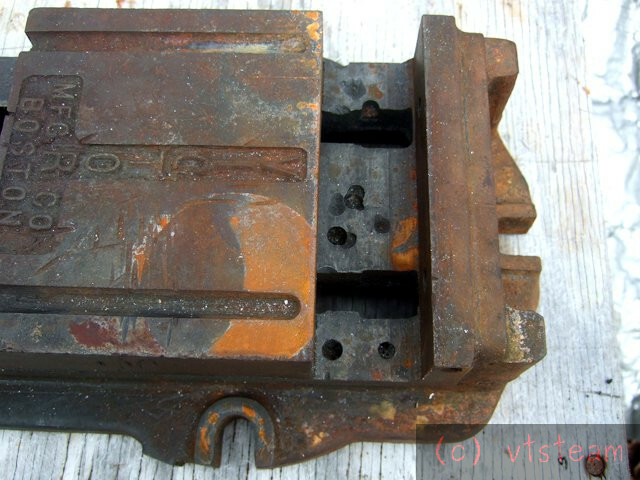 The bare epoxy can be seen in some cuts on top of the vice slide. We have predictions for rain for the next few days so I was anxious to get a coat of paint on before then. In fact there were a few drops while I was painting, so I quickly moved it to the porch while still wet. Good to have it protected now that it has been stripped! Looks well now it's got a coat of paint. Do you have to make a new jaw for it? Yes avid I have to make 2 jaws and a handle for it, and also probably clean up the working surfaces on the mill. Got a little sidetracked -- got my steam engine conversion running yesterday, and now have a cold. But should be back on it shortly. I need the vise to slit saw my QC tool holders. Seems like all projects are coming together at once. That has turned out really nice , a good old solid bit of kit brought back to its best. That vice will be better than most modern vices I bet too. Well done , thanks for posting , I might try the citric acid too. 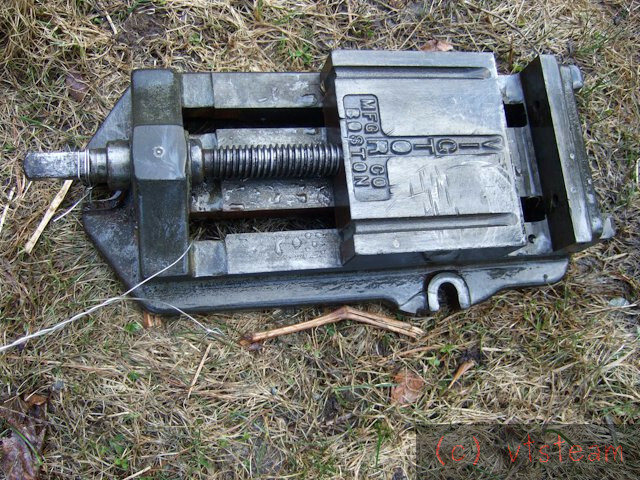 That vise is heavy -- not sure what it weighs but should be good and stable. I used it today on the milling machine. Still thinking about the handle and how I'm going to do it. 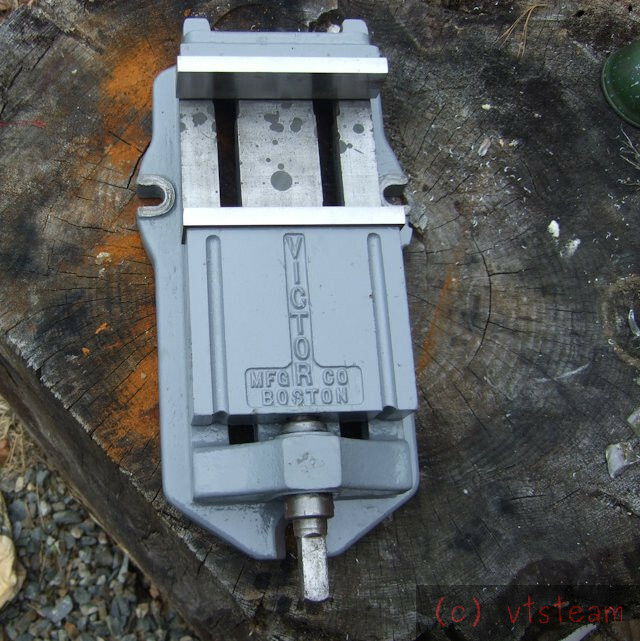 You did a great job , it's now a very nice vise, what a difference to what it started out like. Shame about the ways being drilled, but as we know it wont affect anything now they are filled. At least I now know what JB weld is, it's sold as Quick steel over here in a tube like that. I use it a bit myself on the odd job, great stuff. Do the jaws bolt on from the back? Thanks Davo. 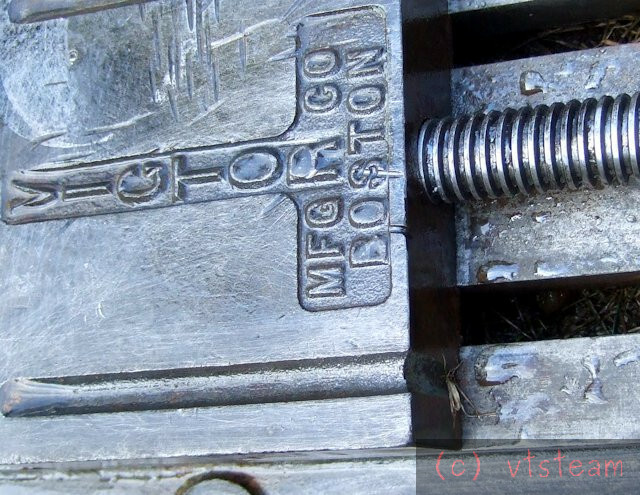 The stationary jaws do bolt on from the back. I tapped the jaw holes, ran the bolts in, and then milled a skim off the whole jaw face so the bolt ends are flush. 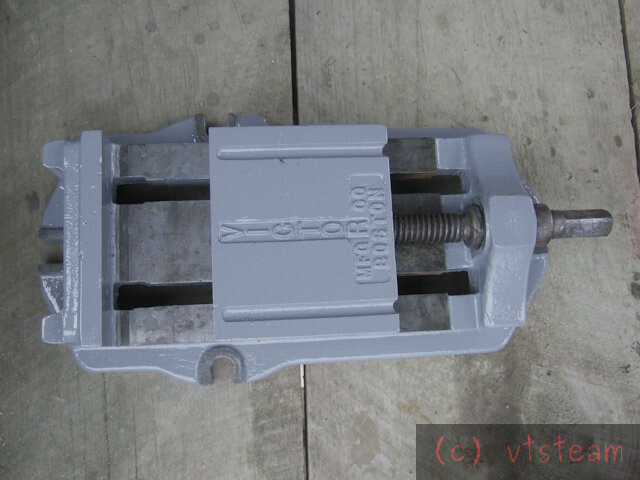 The moving jaws have countersunk flat head bolts that pass into tapped holes in the moving block. 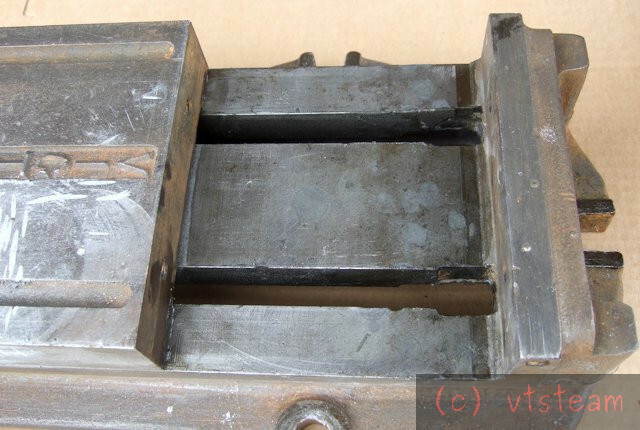 All jaw faces were milled at one go, in place, with the vise bolted square to the mill bed. I should probably put some dowels in. The JB epoxy putty I used is good stuff for filling casting imperfections, but it isn't what we refer to as JB Weld usually, though made by the same company. The putty is not described as "structural". But it's a lot better than Bondo. Regular JB Weld is a two part metal filled epoxy that comes in tubes, like most epoxies. It has a slow (overnight) cure. It is extremely tough stuff, a structural epoxy with a high temperature rating -- 600F, believe. By comparison most common epoxies are softened at about 200F. JB Weld is legendary (or infamous) in the old tractor world, depending on whether you are a farmer or a museum quality restorer! Case in point: I have a 1951 John Deere Model M tractor that is worked hard. When I got it I noticed that the front axle pivot pin had worn an egg shaped hole in the front casting. There was no bushing. Just a hole in the casting. Probably worn through decades before. I could not replace the large frame casting, but replaced the rubber supported bushings in the floating axle support tube behind it and filled in the casting ellipse with JB Weld and drilled it circular to correct dimensions. 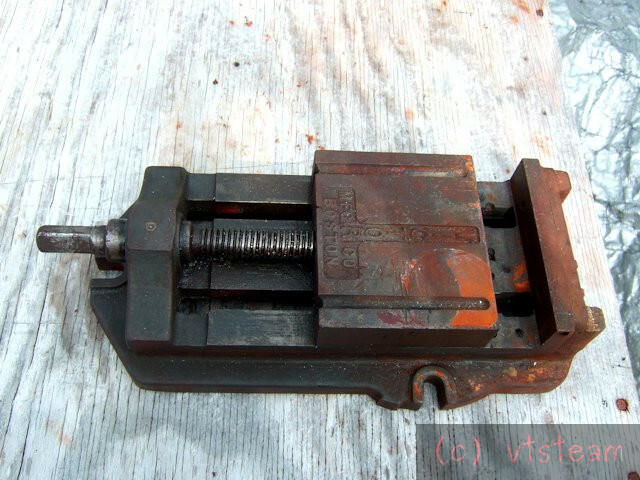 The pin is not supposed to rotate in that hole, although it had in the past because the other bushings were shot. So there is no frictional wear normally. But the full weight of the tractor front end is on it, and it gets hammered. That repair has lasted ten years since then with near daily use on rough terrain -- log hauling, etc. -- with no sign of wear of cracking. So anyway, JB Weld is a good product for cast iron repair where other methods are not available or practical. In my experience, anyway. Photos restored after Photobucket broke links.